With 34,600 members in 139 countries, the TU Berlin Alumni Program is one of the largest of its kind in Germany as well as one of the richest in tradition. Many of our alumni have stayed on in Berlin after graduating and have made their careers here, finding personal happiness along the way. The prospects for university graduates are currently excellent, with the sector of the job market for people with tertiary academic qualifications experiencing a strong expansion. In Berlin job opportunities are particularly good in the areas of education, creative positions, the energy industries and the service sector. 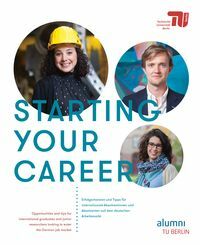 This brochure is intended to provide international students and the new generation of scientists, researchers and scholars at our university looking to enter the German labor market with advice on making the transition to their professional lives. It also contains information concerning contacts who can help them with advice and support at this crucial phase. Our alumni also offer reflections on their experiences of starting out on their careers. The brochure may be ordered free of charge from the TU Berlin's Alumni Team (see right for contact details). You can also download the pdf file (also on the right).